The Science Behind Our Hair Loss Solution. Thinning hair and hair loss can be caused by a variety of internal and external factors. 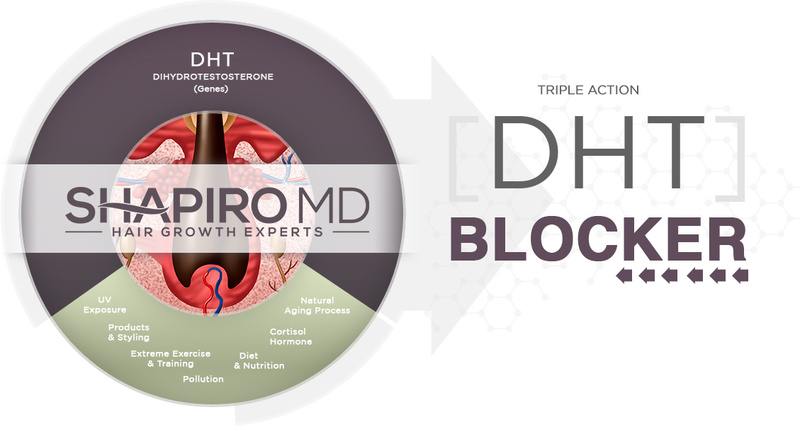 Shapiro MD is different than other natural hair restoration and synthetic treatments because it targets the thinning or shedding hair process by helping to block DHT production and optimizing the hair and scalp using natural ingredients with scientifically studied and understood mechanism of action. Even the only FDA approved ingredient for hair loss, Minoxidil, doesn’t have a ‘known’ mechanism of action. DNA resides in the nuclei of the cells, and provides genetic blueprints that instruct cells how to act. The process of hair growth is part of our genetic makeup, and the DNA inherited from both parents dictates one’s predisposition to thinning or shedding hair. When these hair loss genes are present, they can be triggered by DHT, a hormone present in both men and women after puberty. Thinning or shedding hair is genetic but can be stopped and reversed with natural hair restoration. When testosterone enters the hair follicle cells through gateways known as androgen receptors, it interacts with enzymes that convert it to DHT (Dihydrotestosterone) an unwanted byproduct. Shapiro MD blocks the androgen receptors and prevents testosterone from entering the cell. IF YOU ARE READY FOR A CHANGE, GET STARTED NOW AND ORDER SHAPIRO MD! When DHT production is reduced, hair thinning and shedding genes become dormant, hair ceases and the follicles begin producing healthy, normal hair once again. Take control of your hair and trust in Dr. Shapiro and his team to naturally achieve thicker, fuller and healthier hair. a unique hair loss system developed to help men & women regain Thicker, Fuller Looking Hair. Get Started with Our Triple-Action Hair Care Aid Today! Hair loss is typically caused by excess (DHT) in the body. The proprietary Triple-Action formula in Shapiro MD’s products was developed by dermatologists Dr. Steven Shapiro, M.D., and Dr. Michael Borenstein, M.D. PhD. Designed to help men and women achieve thicker and fuller hair. Most experts agree that DHT is the main culprit for hair loss. Our advanced formulation is the most reliable way to achieve thicker and fuller hair based on decades of scientific research on the root cause of hair loss. Our triple action shampoo and conditioner has helped tens of thousands men and women change their appearance for the better. If you don’t see thicker, fuller looking hair within our 60-day satisfaction guarantee, simply request a refund. 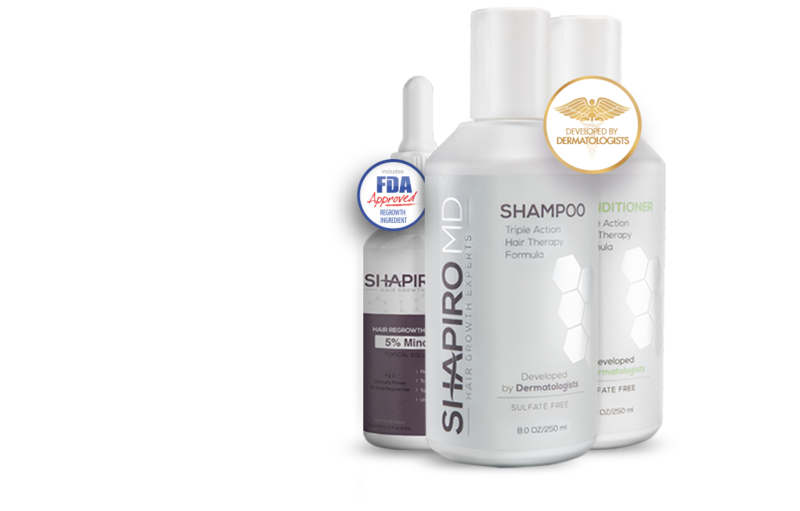 Shapiro MD’s products contain 3 powerful, naturally-occurring DHT blocking ingredients that have helped tens of thousands of people improve the thickness and fullness of their hair. Our patented formulation contains the precise amounts of each ingredient for maximum results.